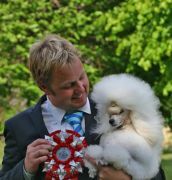 Nappa pictured at the price ceremony for Top Dogs in Sweden. 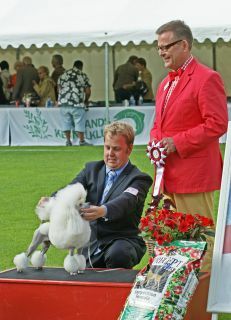 Nappa winning his second group in V�nersborg under breeder judge Anki Johansson. Nappa and Micke after winning his first of five (!) All Breed BIS's. Nappas world famous grand father Ch Smash JP Moon Walk pictured together with his owner/breeder/handler Toshi Omura from Japan.